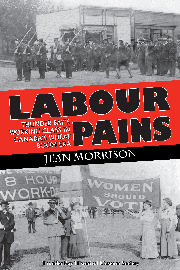 Jean Morrison, Labour Pains: Thunder Bay’s Working Class in Canada’s Wheat Boom Era, Thunder Bay, Ontario: Thunder Bay Historical Museum Society, 2009, 176 p.
This is a study of working class formation. In particular, it is the story of the most advanced Thunder Bay (then Fort William and Port Arthur) workers from the 1880s to World War One as measured by such forms of autonomous institutional completion as trade unions and political parties. Labour Pains is also, and more, a study in class polarization, in often violent struggles with large corporations like the Canadian Pacific and Canadian Northern Railways, in the dissolution of an alliance with middle class community leaders, and between skilled British Canadian workers and unskilled European workers. Such polarization laid the basis for an even more intense era of workers’ struggle across two world wars and the Great Depression. Thunder Bay, as Morrison states, originated in the early 1800s as a crucial, if small, transshipment point in the east-west fur trade. With the advent of European settlement of the prairies, the community grew from a few hundred to a population of 30,000 by 1914 to serve as the key transshipment point of bulk products between rail and steamship lines, like grain into the world economy and machinery and consumer goods into the prairies. As one of the key transshipment nodes in the new east-west national economy, Thunder Bay became a majority ‘workers’ town’ for both highly skilled and unskilled transport workers, from elite railway workers to seasonal coal, freight and grain handlers. As well, Thunder Bay became a settlement base for regional resource workers in North Western Ontario and for service workers within the community. A large and complex wage labour market emerged. To compound the complexity of this new working class formation, there was its multi-ethnic character. While the majority of the wage-worker market was British Canadian (about half native born and half from the United Kingdom), the lower end of the labour market was dominated by European immigrants, Finns, especially in Port Arthur, and Greeks, Italians, and Slavs. Morrison studies the class-conscious elements of this new social formation by focusing on the period between 1903 and 1913 to show a fundamental shift from community solidarity to class polarization as the less skilled majority demanded a living wage. s and Investigation Act of 1907); and as supporters of middle class social gospel reform efforts - like the Presbyterians who established an industrial mission house to 'Canadianize' European immigrants in Fort William's Coal Dock district. However, in 1903, under the leadership of socialist Harry Bryan, the first AFL non-Railway unions were established. But building unions for seasonal less skilled workers didn’t mean achieving stable contracts. The Railway companies fought with every coercive means at their disposal to prevent or repudiate collective agreements. This included victimizing any know union leaders, dividing ethnic groups against each other, and, in a series of strikes from 1903 to 1912, importing strikebreakers and using their own private police force, municipal police, and the militia to confront strikers by force and in the courts. Such was the violence that companies were prepared to use that, on August 12, 1909, the bloodiest labour riot in Canadian history took place in a gun battle between CPR company police and freight handlers. Up to forty men were wounded. The militia then cordoned off the Coal Dock district and searched homes and persons for weapons, to be followed by the arrest and trial of 20 ‘ringleaders’. The suppression of the 1909 Freight Handlers Strike puts in perspective scapegoating non-English immigrants for violence, ‘Bloody Saturday’s’ police riot, and the trials of the Winnipeg General Strike. Nor did a more regulatory consensual approach to industrial relations, the IDIA, work for the lesser skilled majority. Not only did the CPR ignore the Conciliation Board of 1909, so too did the Canadian Northern in the 1912 Coal Handlers’s strike when the legal investigation process was followed. The culmination of this polarizing tendency came in the 1913 Street Railwaymen’s strike. Middle class politicians rejected the past practice of mediation through skilled workers. Instead the middle class civic leadership broke the union for a low wage service model as a way to attract external investment. In fact, the only successful bargaining model to achieve better wages and conditions for lesser skilled workers came in 1912 when there was a labour shortage, given prairie harvest requirements, and socialist leadership in building militant, sectoral strikes at various docks. But the political will to carry a general strike to maintain this victory in 1913 couldn’t be sustained. By World War One, then, as Morrison argues, the cross class consensus of 1900 had given way to a deeply polarized community, driven by class, ethnicity, and among workers, between the limits of Independent Labour Party reformism based on craft unions and the promise of revolutionary socialism in building mass mobilizing industrial unions to lesser skilled workers. This polarization would shape the Canadian class struggle to the 1940s, until better economic conditions, a political purge of the left, and a more comprehensive industrial relations system contained this dynamic. Morrison tells a powerful (and photographically well illustrated) story about the making of one working class community that shows a nationally shared theme of polarization by employers and state against the new waged working class in the formative period of Canadian industrial capitalism. However, it is important to note, as Morrison does, that this is a study largely written in the 1970s with some limits. It does not cover the whole of the Thunder Bay working class for its time period, either in terms of origins (such as waged native labour), the full spectrum of the wage labour market (the unorganized majority who voted Conservative or Liberal), or other social dimensions like gender.